"Trade up to this home and we will buy yours" Motivated seller is looking for a quick settlement. This the first time this home has been offered for sale. 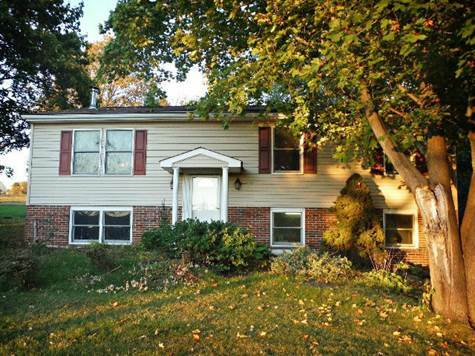 Move in ready Bi-level home has over one acre of beautiful Milford Township to enjoy. The owners have already updated the kitchen for you! The property features a mostly level yard, large rear deck and gazebo, above ground pool(owner can remove), 2 car garage on the lower level, beautiful views of rolling farmland and easy access to the Turnpike and Route 663. Entering the property is the the foyer between levels and you are greeted with hardwood floors and an open concept living space. Enter into the dining room complete with wood stove to keep your home nice and toasty this winter. The dining area flows into the eat in kitchen which will delight any chef in the house. To the rear of the home is the living room also complete with wood burning stove and a view of your expansive backyard. Down the hallway are three generous bedrooms and bathroom with Master Bedroom Access. Great closet space and storage space in all. Downstairs you will enter the mostly finished family room with great daylight windows. Separate room in the rear could be set up as a 4th bedroom or use it for your pool table. Laundry area also on lower level. The two car garage under the home has had one bay converted to workshop area but could easily be converted back to a full two car garage.